I actually did an article on the Dragon Rulers back in 2017, so I’ll link that article here. I’ll keep it shorter here along with how things might have changed nearly two years later. 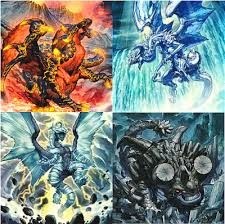 Overall there are four Dragon Ruler monsters (EARTH, FIRE, WATER, and WIND) and they have all been Forbidden since April of 2015. They were released in May of 2013 and at three along with baby forms that each of them had they were able to make a Tier 1 deck with the only other competition being from Spellbooks (which I’ll talk about with the Forbidden Spells). Each Ruler could be summoned from the hand or graveyard by banishing two monsters of either the Dragon-type or the attribute that matches the specific Ruler, also the Rulers searched for a Dragon of their corresponding attribute when they were banished (usually another Ruler of the same name or their baby). The babies could also discard themselves and a Dragon or monster of the corresponding attribute to summon a Dragon Ruler from the deck. They were able to easily abuse the Rank 7 pool with cards like Number 11: Big Eye and Mecha Phantom Beast Dracossack. Eventually the Baby Dragons were banned and the Rulers were still overpowered at three, so they eventually went to one. They stayed around until Number 95: Galaxy-Eyes Dark Matter Dragon came out and that was going to be too powerful with the Dragon Rulers, so they were eventually banned as I mentioned. Nowadays, the TCG still has them banned and the OCG can only play with Tempest currently (the WIND one). Now, can they come back? A big problem of bringing back the Rulers even to 1 is still Number 95, which is now banned in the OCG due to a Gandora-X FTK and if that became a problem in the TCG, then Dark Matter will likely be exiting the TCG game. That has yet to be a problem, though, so there is no reason for the TCG to ban it and bring back the Rulers really. I feel in a much faster game, however, the Rulers will all be interesting to see at one copy per deck. I would like to see each attribute incorporate their own Dragon Ruler and see how much better they become, as each Ruler does have an effect when it is discarded along with a monster of their attribute. It helps since one of the best Rank 7s in the game right now is banned, so that makes the Rulers healthier. 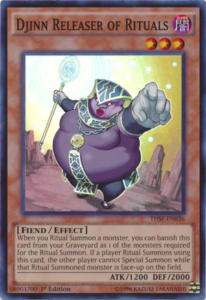 I feel it would make for an interesting experiment if we ever ban Number 95 when the Gandora FTK becomes relevant, but maybe they’ll still be too unhealthy. I feel it is fine to keep them banned, though I really want to be able to experiment. Maybe try bringing back 1 Ruler each format and circulating them. The first Pendulum Monster I will talk about is Astrograph Sorcerer, which was Forbidden in May of 2018 in the TCG and was and currently is limited in the OCG (though they limited a lot more Pendulum cards). What makes Astrograph so good was how he could summon himself when a card you controlled was destroyed and then search for a card with the same name as monster that was destroyed the turn it was summoned, and it was never a once per turn. This was fine when the wave of Pendulum Magician support that contained Astrograph was released in June of 2017, but as we entered Master Rule 4 we got a powerful Link Monster that broke Astrograph wide open. 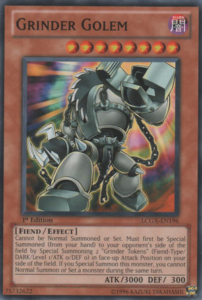 Heavymetalfoes Electrumite was a Link-2 that only needed 2 Pendulum Monsters to summon and upon summon could put a Pendulum from your deck to the Extra Deck face-up, which was more often than not Astrograph Sorcerer. Electrumite could then pop a face-up card to add a card face-up from your Extra Deck to your hand, once again Astrograph. Then your Astrograph could trigger and summon itself to search for a card that was destroyed that turn, which Electrumite did. This generated a lot of advantage, since Electrumite also drew you a card, and it was basically loopable so Astrograph was axed. Now could it come back? We aren’t far removed from the deck being a meta contender and Pendulum Magician still gets its occasional top even with one Electrumite. Plus, the deck didn’t get the hits like it did in the OCG where they just limited everything in the deck that was good. Sure it could help Fusion Summon a Z-ARC for you, but so did Chronograph Sorcerer and the TCG still has three of that, also Chronograph can summon Timegazer Magician from the deck so you don’t have to miss Astrograph summoning Stargazer. There is no need for Astrograph to return at this stage so shortly after it was banned. A card banned before Astrograph was a card that was broken by Master Rule 4, Blackwing – Gofu the Vague Shadow, which both the TCG and OCG banned. The most important thing about Gofu is that if you controlled no monsters, you could Special Summon Gofu from the hand along with two Tokens. Nothing about the Tokens really mattered that much considering they could be used for generic Link Monsters. Before Master Rule 4, Gofu had some cool interactions with other Level 5s for Tzolkin or to be used to Synchro Summon in other decks (Tokens couldn’t be used as Synchro Material) or to give you some tribute fodder (the Gofu, not the Tokens) or have those Tokens for Metalfoes fodder. After Links came out, Gofu was an immediate Link-3, which is something Konami didn’t want as they first limited it in November of 2017 and banned it the very next list in February of 2018. An instant Link-3 is just too good. Now can it come back? Nah, I’m good. This thing can instantly go into Decode Talker still along with Knightmare Unicorn, which came out since it was banned and has a useful effect upon being summoned. We don’t need Gofu in the game right now, maybe if a one card Link-3 gets power-crept, which sounds scary to think about still. 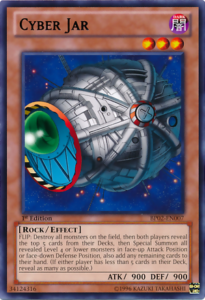 Cyber Jar was banned in April of 2006 and hasn’t left there ever since, though the OCG banned it in March of 2004 and limited it next format until both of them banned it. Cyber Jar is a FLIP Effect Monster that when flipped destroyed every monster that both player’s controlled and then they looked at the top 5 cards of their deck and summoned any Level 4 or lower monsters that could be summoned as possible in face-up Attack or face-down Defense and then whatever wasn’t summoned was added to the player’s hand. I can’t think of a deck that abused this, but I’ve seen a lot of old decks play it, mostly since it is a generic card sorta. I can imagine this really being an advantage to whoever resolved it since you will get to know what your opponent got while you likely used whatever it was you got so it didn’t matter if the opponent got to see it, unless you got Traps to set, which are still dangerous even if the opponent knows if they are set. I feel this card ages better with time as it can destroy floaters and give you monsters to abuse the plethora of summoning mechanics we have now. Also in an era where Traps have fallen out of favor except in certain decks, all you are getting are cards to immediately use to build a board for your opponent to try and break. Cyber Jar is not needed in the game for how annoying it can be and the potential power of it with RNG, but this isn’t the last time I talk about a card like this. 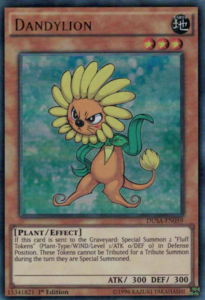 Next up is another card banned on the same list as Gofu for similar reasons, Dandylion. Dandylion is a small monster that when sent to the graveyard summoned you two Dandy Tokens that couldn’t be used as a tributes for a Tribute Summon the turn they were summoned. This card was originally limited in April of 2006, and with Monarchs being a thing and this giving you extra Tokens for future Tribute Summons I can imagine why, but it was semi-limited in March of 2010 to be limited again only a year later. OCG did try to semi-limit it again in January 2017 only to limit it a year later after we got Link Monsters and eventually banned it another year later in January of 2019, and it won’t be a surprise as to why the TCG banned Dandylion in February of 2018. 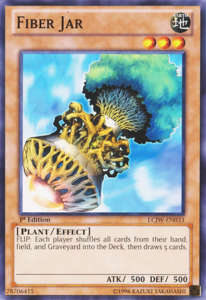 Using a Dandylion for a Link Summon only to get two Tokens for a Link Summon is very powerful, especially when the TCG is expecting a Plant related Link Monster very soon and the OCG has had for over a year. Dandylion was good Tribute Material, good Synchro Material, and now good Link Material. This is the same as Gofu where we don’t need or should have Dandylion back. Aromaseraphy Jasmine is a very powerful Link Monster for anything Plants and the two Tokens that Dandy here gives you immediately summons this. Dandylion is one of the many causalities of Link Summoning and if Jasmine gets power-crept to where Dandy can come back just as a one card Link-3 gets power-crept to where Gofu can come back, then that scenario sounds terrifying to me, but honestly I could see it happening one day. Djinn Releaser of Rituals is one of many Djinn cards that can be used for Ritual Summons, but Releaser is easily the best one. Djinn could be banished from the graveyard to be used for a Ritual Summon, and it was Level 3 so it offered a good amount of Levels. If a player Ritual Summoned using this card, then the opponent of that player cannot Special Summon as long as that Ritual Monster that used this for a tribute (or banished it from the GY for the Ritual Summon) was on the field. This was easy with Nekroz using the Nekroz of Clausolas, which was a Level 3 with 2300 DEF making it hard for monsters to get over since anything with stronger ATK than 2300 likely had to be Tribute Summoned, which wasn’t good in 2015. 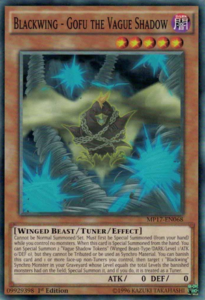 People played Bull Blader just to out a monster that used Djinn for its summon, which no one should have to run Bull Blader to out a specific scenario, so Djinn was banned in the TCG, though oddly I don’t think the OCG didn’t ban this mostly since they had Diamond Dust much earlier than we did to out a monster that used Djinn, which is a much better card. This card was set up easier by a card I’ll talk about with Banned Extra Deck Monsters putting Djinn in the graveyard. Now, can Djinn come back? I mean, I don’t think it’ll be as degenerate as it was in 2015. Nekroz are slowly making a comeback now with their cards coming off the list and they aren’t destroying the meta again, which applies to the OCG with three Nekroz of Brionac, three Shurit, and three of this and Nekroz aren’t topping that much. Even if Nekroz did become relevant with this, we have better outs for it now. I feel Djinn is fine to come back into the game, to be honest while the TCG is now pushing Nekroz cards back into the format. I feel it is similar to Archlord Krystia, if no one can make it meta with 3 Krystia, then Djinn should be back at three if nobody is making it meta, and the OCG does tell us that nobody is making it meta with Nekroz almost at full power with the exception of Unicore and Nekroz Cycle being limited over there and Shurit and Unicore being limited over here. Another Pendulum monster, this time is Double Iris Magician, who was banned in February of 2018. 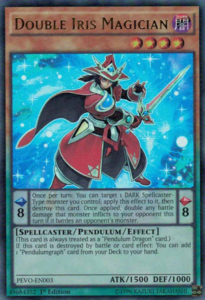 This card was banned the same weekend Heavymetalfoes Electrumite was made legal in the TCG to make sure we don’t have to deal with full power Pendulum Magician in the TCG based off what results the OCG were showing us. Electrumite would of been good with this to pop it and abuse Astrograph, but also Double Iris would of searched for a Pendulumgraph card. There were two Pendulumgraph cards, one good for more searching and another good for disruption. Having three of this, three Astrograph, and three Electrumite would of been too consistent at that time, especially with SPYRALs taking the final hit to stop it from being Tier 1. Pendulum Magician would of been super consistent if the February 2018 list didn’t first hit this and another card related to Pendulum Magician. Now can it come back? With Astrograph banned, I feel this is fine at one again. I did mention with Astrograph that Pendulum Magician still gets the occasional top, but I don’t think Double Iris will break the deck open as much as Astrograph would. It’d help add to some consistency and power by making the Pendulumgraphs more useful by making them searchable, plus it’ll give the Magician that is treated as a Pendulum Dragon back so Chronograph can summon Z-ARC with greater ease. One of the more recent cards to be banned is Fairy Tail – Snow, which was banned in the TCG in January of 2019. This card was first really good when That Grass Looks Greener came out, and that was more potent in the OCG where they didn’t want to hit Grass at first, so they semi-limited and eventually limited Snow only to semi-limit it. The TCG had problems with Grass as well, but they decided to go for Grass instead of Snow. This allowed Snow to be more potent in the Danger! Thunder Dragon deck by being able to easily access Curious to dump the Snow, which the Danger! monsters helped you summon, or you didn’t have to summon Curious if a Danger! went ahead and discarded the Snow. Snow could then banish some Thunder Dragons and other cards to revive herself and be a Book of Moon on legs while triggering many Thunder Dragons for plusses. This was too powerful, so Konami decided to ban Snow in the TCG. The OCG didn’t have to deal with this as they don’t have Danger! monsters yet. Now, since Snow was just banned, it’s easier to say that it can’t come back since it was just recently a very powerful card. However, I’m wondering why Snow wasn’t banned sooner. The card was always abusable, with or without Grass, and Thunder Dragons showed that the best with the Danger! monsters getting you to Curious. I feel the banning of Snow was long overdue, even with Grass being gone. Fiber Jar is another FLIP Monster that was limited in July of 2003, before there were bans, and was eventually banned in April of 2005 and has never seen the light of day since. When Flipped, Fiber Jar took every card on the field, GY, and hand and shuffled them into their owner’s decks and then both player’s drew 5 cards. Long story short, it is a reset button that doesn’t touch life points or the banished pile. If you’re losing, you just get to reset the duel and try again. If you are winning in life points but are low on cards, just use Jar to set everything back up and use the reseted game to finish however many life points your opponent has left. Imagine this if you banished a ton of your opponent’s cards. The same list that unbanned Black Luster Soldier – Envoy of the Beginning in September of 2011 also banned a little fish guy. 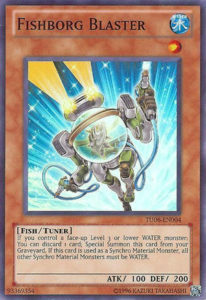 Fishborg Blaster is a Level 1 Tuner that could keep being revived by discarding a card just as long as you controlled a Level 3 or lower WATER Monster. The only downside with this card was that if it was used as Synchro Material, then all your other materials for that Synchro Summon must be WATER. This allowed for mass Synchro Summons with Superancient Deepsea King Coelacanth summoning a ton of Fishes from your deck, including this. This gets more absurd with cards like Hyper Librarian and Formula Synchron allowing you to get some draws, meaning it is easy to OTK just as long as you kept a Level 3 WATER on the field long enough to do all your Synchro stuff. It easily summoned Shooting Star Dragon, which is a solid card overall and better by 2011 standards. This made quick Synchro OTKs back in 2011 and Fishborg might just be better with Link Monsters since it isn’t a hard once per turn. Can this card come back? With Link Summons being a thing, no. Even before Master Rule 4, I can imagine this being used for mass Synchros, which the pool of Synchros has expanded with so many better Synchros vs 2011. Fishborg Blaster could easily be errataed to be a hard once per turn and then it can come back, but in its current state returning is a bad idea. Another card I did an article on discussing how much of a problem it would be, which you can check out here. This card was limited the next F/L list in February of 2018 after I made that article, but you only needed 1 Grinder Golem to make use out of it. With Security Dragon incoming to the TCG, Grinder Golem will be at full potential and I can understand banning it now. It was also broken in a Slash Draw FTK since Slash Draw needed your opponent to control a card, so just give them a Grinder Golem and use Saryuja and Danger! monsters to go through your deck and Saryuja will stack your deck to make sure you can resolve Slash Draw. That was hit with Slash Draw going to one, but the Link potential was still there for Grinder Golem, so he had to go. No longer was it only fodder for Inferno Tempest. Just like Fairy Tail – Snow, Grinder Golem was just banned and it was recently very powerful and it’ll only get better with Duel Power giving us Security Dragon, even with Firewall Dragon being banned now to prevent more Grinder Golem brokeness. If the Grinder Golem play gets power-crept, then I’m scared for that environment and how fast it is. Another card from the February 2018 list, this time it is Level Eater. For the longest of time, Level Eater was being innocent in Synchro Decks that were strong, but not broken, so he was never a problem. The OCG did have a DARK Synchro deck they didn’t want to deal with, so they banned Level Eater at that time. The TCG banned Level Eater for a different reason, Link Summoning. Just imagine having a very high level monster on the field and Level Eater in the graveyard. Level Eater will just keep lowering the level of a high level monster and revive itself to be used as Link Material over and over again. It never really became broken in the TCG, though some decks could Extra Link with it, but they didn’t want to limit future card design so they banned Level Eater for the betterment of the game before we got deep into Link Summoning and we find Level Eater breaking a deck open. Level Eater needs an errata to be a hard once per turn or to not be able to be used as Link Material I feel, then we can see it come back. Limiting it from being used for Links means the old Synchro stuff can still be done with proper setup, but the hard once per turn might be better if that Synchro stuff gets overpowered eventually. In its current state, Level Eater cannot return. Magical Scientist was limited in February of 2004 and later banned in April of 2005 and for good reason, an FTK. Magical Scientist was used in an FTK with Catapult Turtle to summon many Level 6 Fusions for Turtle to tribute off for some burn damage, this was made more consistent with Last Will easily summoning Scientist from the deck and Monster Gate tributing a monster to hopefully get to Turtle or Scientist while Last Will gets the other. 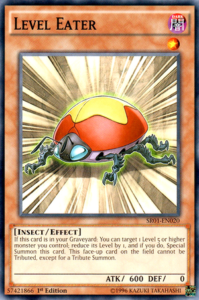 Scientist did require you to pay 1000 life points to summon it, so it was limited, but you can summon Fusions stronger than 2000 ATK for Turtle to do more damage than you pay, cause imagine this without a life point cost or a lower one back when the Extra Deck could be an infinite size. This did get Scientist banned, and even with Turtle being a once per turn now, there are still a ton of plays for Scientist. Can it come back? Easily a no here. 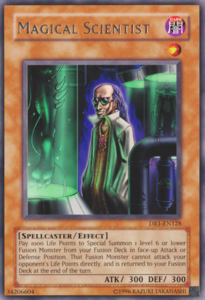 Before Master Rule 4, Scientist could help you summon a ton of Fusion Monsters from your Extra Deck to summon Xyz Monsters in decks that have no business summoning them. This can still be possible with Links as long as you open up enough zones, but Scientist can help give you Link Material as well. The cost of 1000 LP does limit you, but you can somehow change its type to Psychic just to abuse one of two cards that prevent you from paying LP for Psychic monster’s effects if you wish, though that is nice. Scientist will abuse the Extra Deck mechanics if it returned, despite a 15 card limit there, so it can stay banned until it becomes a hard once per turn. Majespecter Unicorn – Kirin is another Pendulum Monster, though probably the only one hit that had generic uses beyond its archetype. First off, Majespecter Unicorn – Bunbuku could search for this thing, which is powerful in Pendulum Decks where all Pendulums basically float. Kirin was eventually limited in August of 2016 and later banned in March of 2017 for how powerful it was in any Pendulum Deck. It being Level 6 was good for decks with a wide range of scales like Metalfoes having 1 and 8 scales. Kirin was untargetable and couldn’t be destroyed by card effects and once per turn, during either player’s turn, allowed you to bounce a Pendulum in your Monster Zone and a card your opponent controls to the hand. 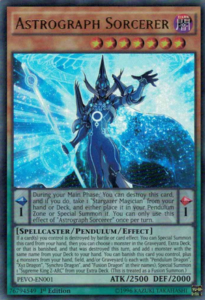 This card was hard to out and very disruptive, and it being searchable didn’t help its case, so it was banned to prevent many Pendulum Decks abusing this, cause we all know Pendulum Magician could of used this. Now can it come back? I don’t think this will be good for the game. 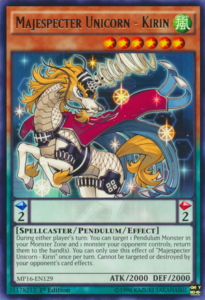 Konami will likely keep printing Pendulum Monsters, and any Pendulum Deck with the right scales can use Kirin. It is hard to get rid of and once again it can be very disruptive. Kirin is too powerful for many Pendulum Decks and should stay Forbidden for a long time. 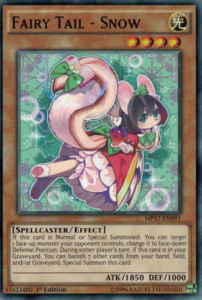 Makyura the Destructor was banned in April of 2005 right after its release in the TCG and I know the OCG banned it the first chance they got when they finally banned cards. 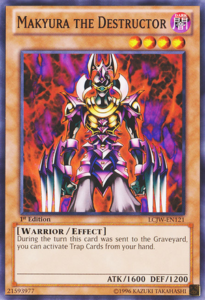 Makyura allowed you to activate Trap Cards from your hand the turn it was sent to the GY. I can imagine many uses of this, one being Exchange of the Spirit FTK before that card was errataed by using draw Spells and Traps from your hand to fill your graveyard to trigger Exchange of the Spirit and deck your opponent out with one card. This takes the balanced part of Traps and nullifies it since you no longer need to set Traps to use them. Temple of the Kings was banned in the TCG upon its release because it allowed you to use all Traps the turn they were set before that was errataed to being only once a turn. Can Makyura come back? Another lolno from me. I know Konami is now printing Traps to be usable from the hand now, but first they typically have to meet some condition. This doesn’t need any condition for those Traps, it just lets you use them. Traps are meant to be set unless they otherwise let you around that by controlling no cards or something. Makyura could maybe come back if it only let you activate 1 Trap from the hand like how Temple of the Kings only lets you use 1 Trap the turn it was set. So far, we can see many cards that are Forbidden deserve their spot still, even if most of them so far were recently added because they were recently broken. A few cards would be fun to try and bring back, the Dragon Ruler experiment I mentioned sounds interesting, and other cards I mentioned could come back are fine due to power creep or the decks they were in being hit harder at this point. I’m not doing them all at once as I mentioned so I don’t overwhelm you all here. So my next article which will hopefully come in a few days will talk about the remaining banned Main Deck Monsters before I move on to the Extra Deck and eventually Spells and Traps.